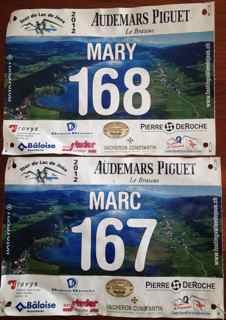 Saturday after our epic Bettmeralp adventure, Marc and I climb in the car and head up to the lac du Joux, in the Jura mountains. It’s the hottest day of the summer (so far), with 33˚ temperatures down in Lausanne. The 24-km race around the lake starts at 2:15 pm, so we’ll be running smack in the highest heat of the day. But over in the US, the entire country is sweltering in 90+ temperatures, so I refuse to feel sorry for myself. In comparison, this is nothing. My speedy friend Monica is also running this race, and my goal is to see if I can keep her in sight. The first part of the race is hilly, but the second part is flat as a pancake. I lose sight of Monica just before the halfway point, after she zips past me on a steep, rocky descent. Never mind, I tell myself. Just run your race. I’m feeling slightly panicked because I’m really tired and I still have 12 km to go and it’s really hot. With 2 km to go, I see Monica up ahead of me! Wow! I start running a bit faster, but not too much. I don’t want to bonk now. Over the last kilometer, I am definitely ready for this race to end. Marc and some other guy (who turns out to be Monica’s husband, who I know well but didn’t recognize) are cheering madly for me at the end, I make a last strong acceleration to the finish, and then go collapse under a tree. What an effort! I did an experiment with the 20km de Lausanne using an iPod, and I felt then that it helped. But after this race I almost think that mental music is better. It’s like a mantra, you just repeat the same thing over and over in your brain, and kind of slip into a zone. With the iPod, you’re at the mercy of whatever song comes up next. If it doesn’t match where you are mentally, it doesn’t help and can actually make you feel worse. For you runners out there, what do you do to find that zone – to stay focused, strong, yet calm during a race? This entry was posted in Running, Switzerland and tagged music, race report, running, trail running by gydle. Bookmark the permalink. I’m a little awestruck by your recent performances, the difficulty of the courses, and the panoramic scenery. Its wonderful that Marc and yourself are able to continue running in such an enviable environment. Talking of music, I’m an inveterate iPod user, with a mad mix of music ranging from Martin Lass to Journey, songs from the 80s to modern pop, with a bit of country and western thrown in. I’m not into “power” tunes, as I tend to zone-out when running and the music fades to the background. Recently, I picked up on a YouTube clip, courtesy of the Natural Running Center web site, and the song keeps running through my mind, although it wouldn’t be my choice of music normally (despite my plebeian tastes). Rather than embed it in these comments, I’ll email the clip. Am doing much of my running in Skora Forms (expensive little beasts). How are the Brooks performing? Hey Les, thanks for the comment. I have one more even gnarlier race to report on, believe it or not! Coming up later this week. I’ve gotten behind. My Brooks were fine until the Trail de l’absinthe, where the right shoe developed a strange ridge just over my toes on the inside of the toe box. I have sent them back to Brooks and hope to get a replacement pair. In the meantime, I bought a pair of Inov8 terraflys – and they are amazing. I LOVE those shoes. I raced the lac du joux in them and also the race we did this past weekend. Only problem is the right shoe has developed a strange clicking sound with the ball of the foot flex, and it drives me nuts. I took them back to the store who has sent them back to Inov8. What’s with me and right shoes??? Maybe I need to blog about it! Thanks for the clip! I’m going to be getting this for my iPod list – the BPM is perfect for my pace – right around 88-90. I hate power pump music, my mix sounds a bit like yours. Maybe one of these days I’ll publish it for people looking for 85-90 bpm stuff.